Expansive hosting retreat in chic Long Island, NY backyard. Combining minimalism with elegance, this multi-tiered hardscape design transformed the outdoor living space of a Long Island, NY home. On the heart of Long Island, designers blended style with functionality, utilizing the whole of the property for hosting guests, preparing and serving summer meals and lounging by the pool on the sun-filled patio. 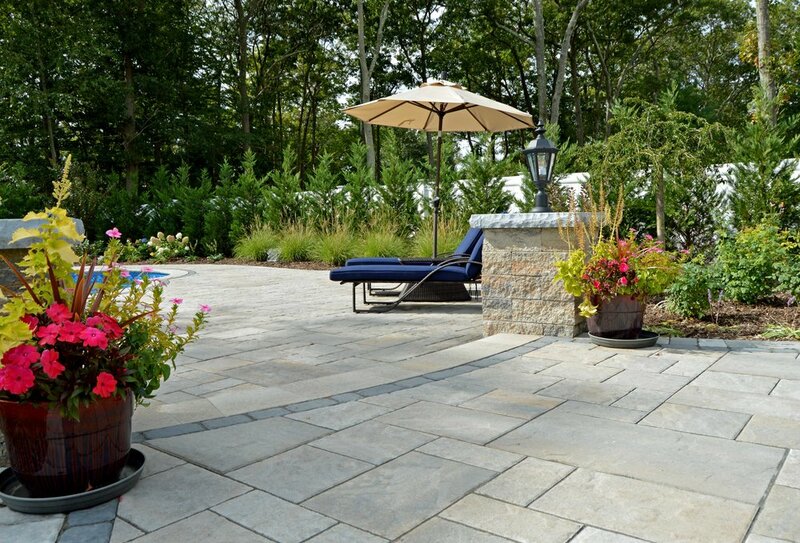 With the use of softly toned Techo Bloc concrete pavers, Above All Masonry Design incorporated flow and structure while balancing with the existing natural setting. Family and guests travel down the paver walkway, through the expansive outdoor kitchen and dining space and out to the poolside deck or fire pit lounge area. Balanced with vibrant landscaping and lighting design, this Long Island home can now host large groups of family and friends with ease.